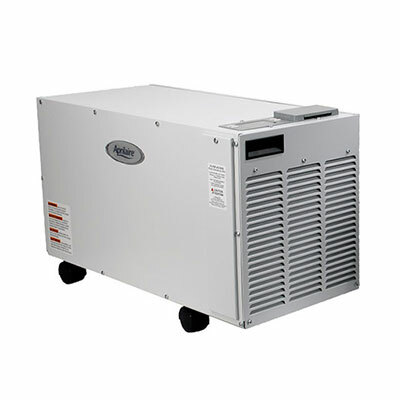 Whole Home Pro Dehumidifier, Removes Up to 95 pints of Water/Day. The Aprilaire 1850 Dehumidifier is ideal for dehumidifying your whole home removing up to 95 pints (11.9 gallons) of water per day. For your convenience, it can be ducted to your HVAC system, and the control panel can be mounted on the top or side of the unit so it is easy to access in any location. The dehumidifier has a simple to use interactive display making set-up and use a breeze. The Aprilaire 1850 is low maintenance with no messy trays to empty, and simple once a year filter cleaning or replacement. The Aprilaire 1850 was designed and manufactured in the U.S. by Aprilaire and built to last. Aprilaire continues to improve the quality of its dehumidifiers with corrosion-resistant aluminum coils, quality manufacturing processes to prevent leaks, and robust packaging for damage-free shipment. To give you even more peace of mind, it’s backed by a 5-year warranty.